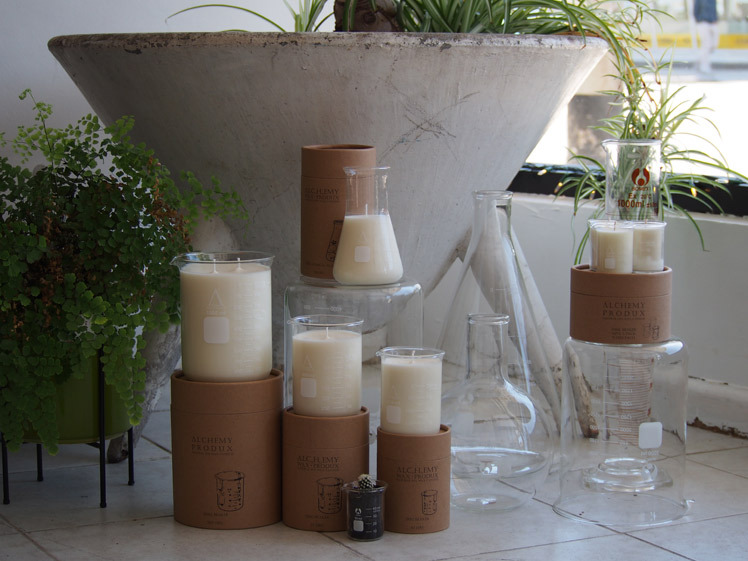 FK chats to Sara of artisan candle label, Alchemy Produx combining the perfect fusion of science and designer homewares. 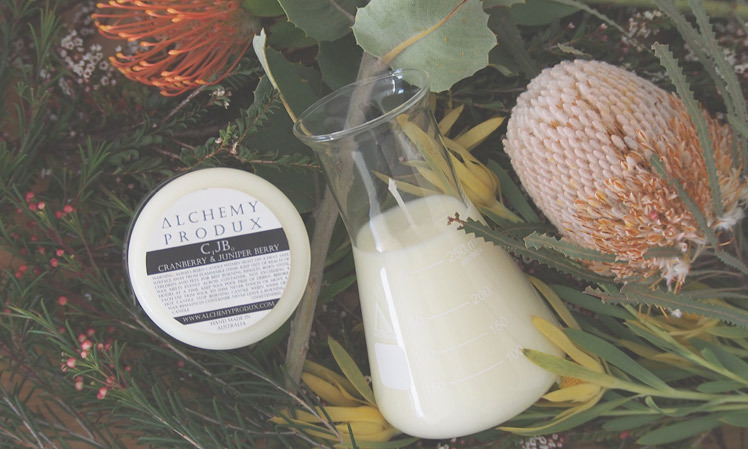 Tell us a bit about ALCHEMY PRODUX and what products we can expect to discover? Alchemy Produx is the brainchild of my Partner Tristan and I, we hand-make artisan candles from 100% natural soy wax. 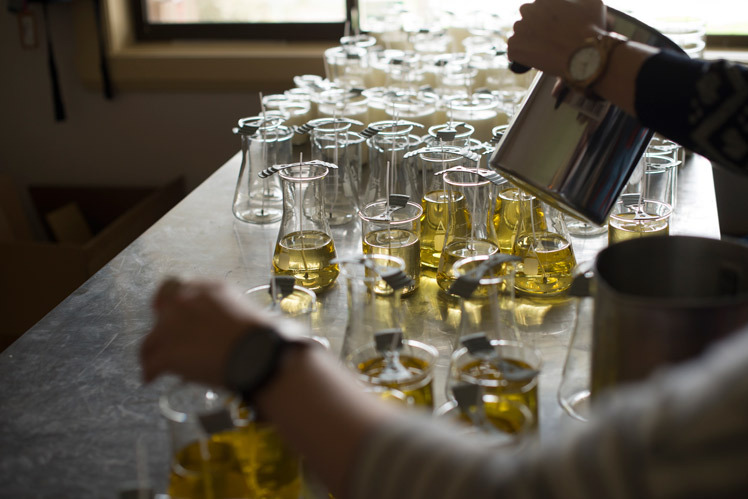 Our candles are individually hand poured into chemistry glassware such as beakers and conical flasks and made to order in our Melbourne studio. We are inspired by minimalist and industrial trends and live by the mantra “less is more”. Also, we always enjoy sparking chemistry class nostalgia upon our audience. What are your backgrounds and how did you start working together? It was three years ago, I was making candles, experimenting with soy wax and pouring into whatever ever vessel I could find around the house. Tristan came home from the lab one day and put a beaker in front of me, we haven’t looked back since. We accidentally combined our background in Fashion Design and Chemistry to create our unique candles. 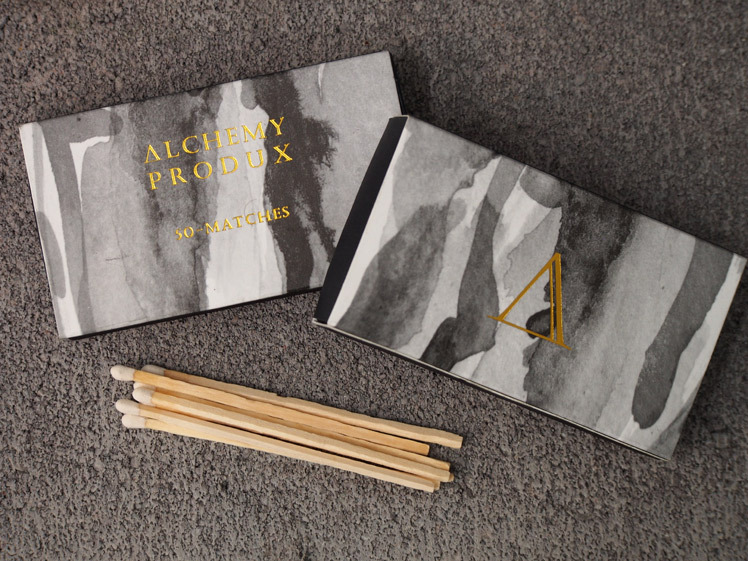 This unlikely combination led to the beginning of ‘Alchemy Produx’ a fusing of science and designer home wares. 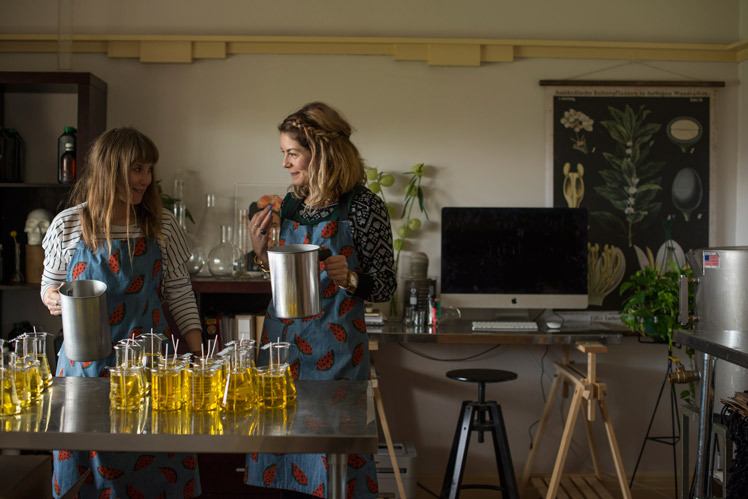 What do you love about working with candles and what keeps you creatively motivated? 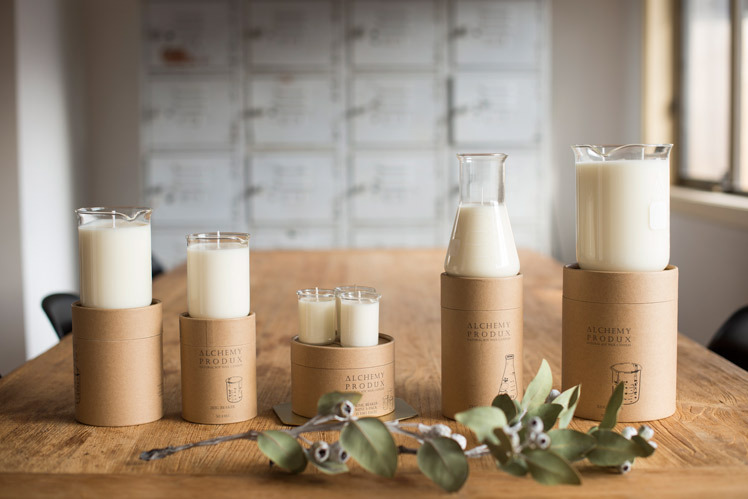 Our candles are made with natural soy wax, so it is great to work with and rewarding to know we are reducing our environmental impact and working with an eco-friendly, renewable and sustainable product. We also love creating new fragrances; we currently have 11 fragrances and are currently working on a watermelon blend. Our range has definite trends towards citrus, herbal and botanical blends and a serious lack of floral! I think the desire to expand our empire and stay one step ahead is what keeps me creatively motivated; I enjoy developing new products and ideas, we have just added some matches to our range which is exciting. We have just moved the business out of our home and into a commercial space; we are loving decorating the studio and making a creative and inspiring atmosphere. We are filling it with loads of plants, artwork, and laboratory glass wear and of course candles. Coming from a design background, my creative process involves a lot of design development; I spend a lot of time researching current trends, not necessarily candle trends but more home wares, fashion and architecture. It’s always great to have someone to brainstorm ideas with to keep me motivated and moving forward, my assistant (and BFF) Kerri, and I have some excellent brainstorming sessions, drinking tea and talking about our grand plans. 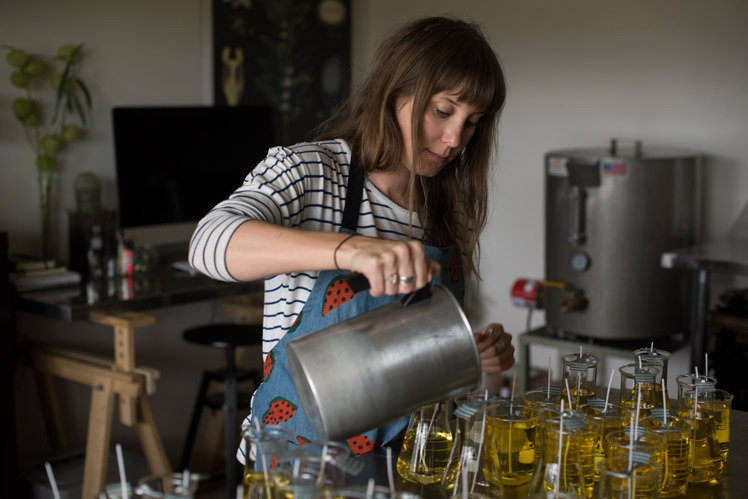 I decided to focus on Alchemy as I was working long hours at a label on the other side of the city and then coming home and pouring candles all night to prepare for the Rose St Artist’s Market on the weekends. 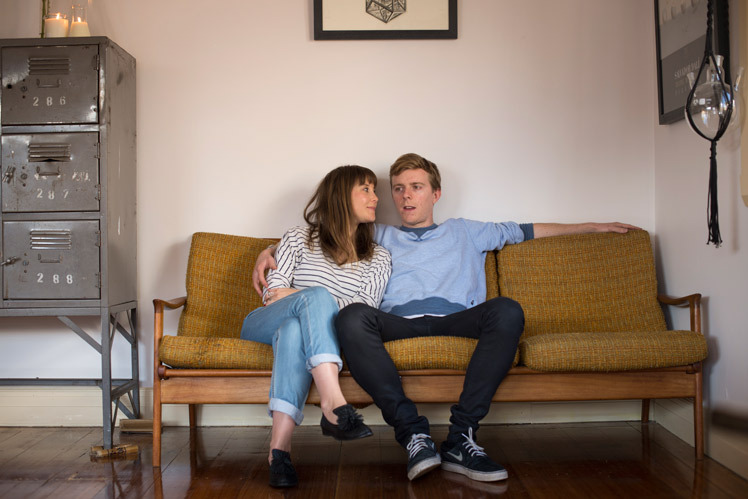 I was lucky that I had a supportive partner who believed in what we were doing and pushed me to make the hard decision to go full time with Alchemy. There were many challenges along the way; I am a very shy person so having my own label as forced me to gain confidence. I love running a small business and really enjoy working with like-minded people who are doing it for them selves! Mostly I love the freedom, I work better at night so it is ideal being able to pick and choose when I go to work. I also love that my two dogs can come to work with me every day; I love having them around to bounce ideas off all day long (even though they don’t talk back to me!). What new plans do you have for ALCHEMY PRODUX this year? In order to keep things new and different we have started some collaborations with other Melbourne artists and designers, it’s been really exciting and fun to create new products with people that we admire. We are also excited to announce we are launching a new top-secret project at the Melbourne Finders Keepers Market this October, so be sure to keep your eyes and ears open.